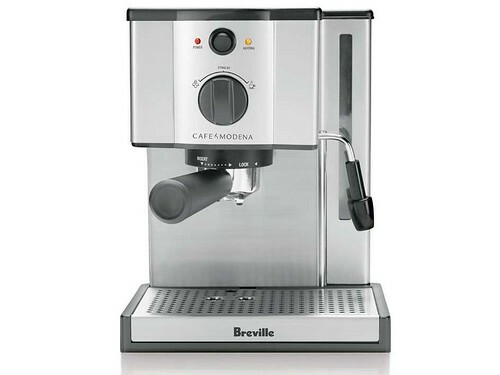 The Breville ESP6SXL Café Modena Espresso Machine — The perfect introduction to at-home espresso drinks. 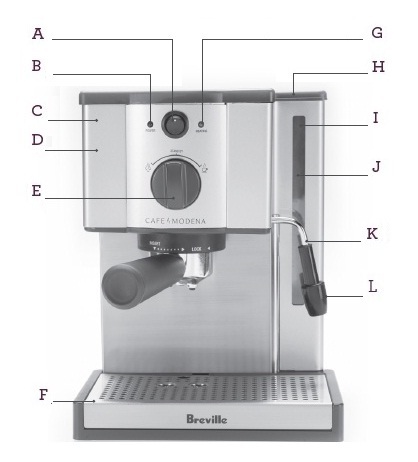 Makes delicious cappuccinos, lattes, mochas and more. Includes stainless steel frothing pitcher and café-inspired cup and saucer for a coffee-house experience in your kitchen. G. 'Heating' Light (Orange) - Illuminates to indicate that the machine is heating and will turn off when the correct temperature has been reached. This light will cycle on and off during operation to indicate the machine is maintaining the correct temperature. H. Removable 40 fl.oz. (1.2 Liter) Water Tank. I. Water Level Indicator. J. External Water Window. K. Steam Wand with Froth Enhancer. L. Steam Baffle.